This week we read Parasha called Shlach L’kha (Send on your behalf) in Numbers 13:1-15:41 and Joshua 2:1-24. In Numbers, God gives Moses an order to send the leaders from 12 tribes of Israel to reconnoiter the land of Canaan, the Promised land. They were given instructions to see how the land was, if it was good or bad, in what kind of cities people lived and whether the land was fertile or unproductive. Moses also told the 12 men to be bold enough to bring back fruits of the land. When the men return they bring news from the Land. They tell the people of Israel that the Land is exactly as pictured by God, flowing with milk and honey, but also very terrifying people live there in fortified cities. With their bad news they make the hearts of the Israelites fail and they start grumbling against Moses and Aron in fear. Caleb, along with Joshua, was the only one who tried to convince the people that God would defeat their enemies and would give the land easily to them. However, not even their words would make the Israelites have faith in God. That arouse the wrath of God and he swore that not even one person of that generation would enter the promised land, except Caleb and Joshua who had not rebelled against Him. As the 12 men reconnoited the land of Canaan for 40 days, so would the people of Israel wonder in the desert for 40 years as a consequence for their sin, one year per one day! What a severe consequence. After the Israelites heard the punishment of God, they repented and wanted to go to the Land by themselves. However, it was too late for them. God had given His punishment and wouldn’t turn away from that. Although God forgives, the sin and disobedience has always consequenses. The saddest thing was that the people of Israel were on the edge of entering into the promises of God but they let their hearts fail with fear at the last minute, forgetting what God had just done in Egypt. And they could no longer receive the promise after that. Only their children did. Even today God sends men from the nations “to spy the promised land”. He has promises for the nations that are fulfilled as they align with God’s will. From every nation he seeks men and women whom He can entrust the task to bring the message to bless Israel, to seek the wellbeing of Israel and to tell that this is one of the key to the wellbeing and fulfilment of the destiny of each nation. You may well be the “messenger” God has chosen to bring the news from the Promised Land to your friends, church and even the leaders of your nation! When God gives a promise, the enemy tries to stop us from entering into those promises. The battle is fiercest just before the victory, but don’t let your heart fail! God is with you until the end! He will lead you into victory of your enemies and of your fears, just don’t quit too early. 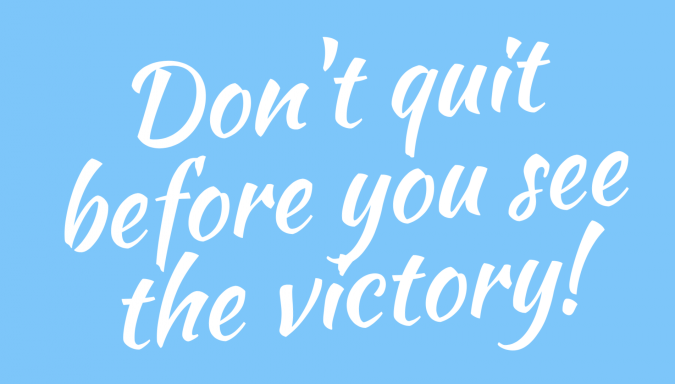 Don’t quit before you see the victory of God of Israel for you and you have tasted the fruit of the promises yourself. By the way, if you have been wondering on your trip to Israel or seeing religious Jews elsewhere, why do Jewish men have four white strings hanging on their waist. In Numbers 15:37-40 you will find the reason for that. God gives the Israelites an order to put tzitzit on each corner of their thread in order to remember God’s regulations and to obey them. We, on the other hand, are happy to have Holy Spirit who has promised to always remind us of everything!